We’re very pleased to announce that a new version of Sibelius’s little brother, Sibelius First, is available from today, with some great new features never before seen in music notation software (including Sibelius 7!). Sibelius First is designed for home users, students, instrumental teachers, songwriters, choir masters – anybody who needs to quickly and easily produce beautiful sheet music, but who doesn’t need all the power and flexibility of the full Sibelius 7 product. The new Sibelius First replaces the existing versions of both Sibelius First and Sibelius Student, which were separate entry-level products with similar feature sets, though there were some key differences, such as the inclusion of dynamic parts in Sibelius First but not Sibelius Student, and the inclusion of Panorama in Sibelius Student but not Sibelius First. With the new Sibelius First, we’ve combined the feature sets of both products to produce an even more powerful and comprehensive music notation package, at a pretty amazing price. These features are exclusive to Sibelius First and are not included even in the full Sibelius 7 product. They are (if you will excuse the pun) firsts for music notation software! Read on for more details. 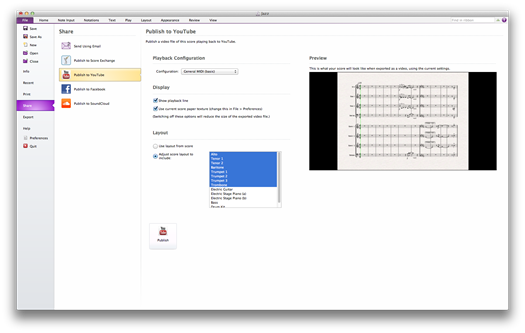 The new Sibelius First allows you to export a digital video of your score. It’s super easy: choose File > Export > Video, and choose which resolution you want to export (all the way up to full HD 1080p! ), choose which staves you want to include, and hit Export. A video file (.mov on Mac, .wmv on Windows) is exported to your chosen folder, ready for you to play in any media player. But that’s only half the story: you can publish your video directly to YouTube or Facebook by choosing File > Share > Publish to YouTube or Publish to Facebook. You don’t need to figure out what format to use, or how to upload the video on each site: just click Publish, and Sibelius exports the video file and uploads it automatically, allowing you to get on with crafting your next masterpiece, a handy progress indicator in the status bar at the bottom of the window letting you know when the upload is complete and the video is available to view. Publishing your music directly to YouTube or Facebook is a great alternative to publishing using Scorch on your own web site. All desktop web browsers and most smartphones can access YouTube videos, so anybody on any computer or mobile device can see and hear your music. Share your song online with your bandmates, or the singers in your choir, and they can rehearse along with the video, or just leave you a friendly comment! You can also export audio directly to Soundcloud, again with a single click, in File > Share > Publish to SoundCloud. If you want to publish digital sheet music and sell it online, you can publish directly to ScoreExchange.com, the world’s largest catalogue of user-created digital sheet music, with around 75,000 titles created by musicians from all over the world. ScoreExchange.com uses Scorch, so you can view, play back, transpose sheet music in your web browser, then purchase a copy to print on your own printer at home. Publishing your music on ScoreExchange.com also allows you to make it available for sale in the Scorch Store in the Avid Scorch app for iPad, allowing anybody with an iPad to download your score and add it to their library. You can receive a royalty for every score sold via ScoreExchange.com or via the Scorch Store! 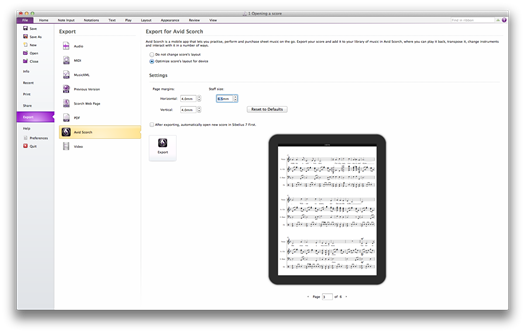 The Avid Scorch app for iPad allows you to view, transpose, play back and interact with scores created in Sibelius. The new File > Export > Avid Scorch feature in the new Sibelius First automatically adjusts the formatting of your score to optimize it for display on the iPad’s screen, allowing you to shrink the page margins and adjust the staff size to make the music as legible as possible on the iPad. Then simply drag the exported score into iTunes and sync your iPad to add it to your Avid Scorch library, or put it in your Dropbox and open it in Avid Scorch from there. The new Sibelius First makes it super easy to share your scores by email. 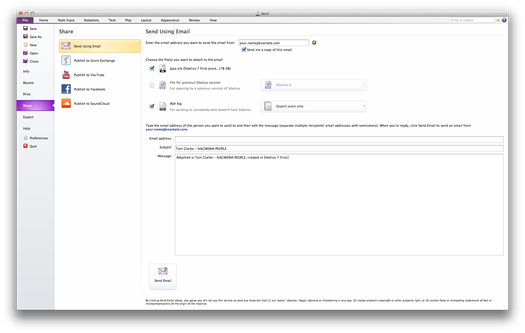 Simply choose File > Export > Send Using Email, enter your own email address (so that the recipient knows who’s sending them music), the recipient’s email address, and then choose whether to send a Sibelius score (including, optionally, a version suitable for opening in any earlier version of Sibelius) or a beautiful, publication-quality PDF. It couldn’t be easier or quicker to share your music with anybody with an email address, whether or not they have Sibelius or Sibelius First themselves! The new Sibelius First includes a high-quality 10GB sound library, called Sibelius 7 First Sounds, which takes sounds from the amazing Sibelius 7 Sounds library included with the full Sibelius 7 and makes them available to users of our entry-level notation software. Beautiful sampled wind, strings, brass, percussion, keyboards, guitars and organs are included, making the new Sibelius First sound amazing. And you get all of the power of Sibelius 7’s Mixer, plus the ability to use any VST or Audio Unit virtual instrument or effect, as well as allowing you to connect to any ReWire host. The new Sibelius First is available today, with a recommended price of $119 in the US, £99 inc. VAT in the UK, and €119 inc. VAT in Europe. A five-user license is also available for $299 in the US, £239 inc. VAT in the UK, and €289 inc. VAT in Europe. If you have a previous version of Sibelius First, Sibelius Student (or even G7 or Sibelius Instrumental Teacher Edition), you can upgrade to the new Sibelius First for $39.95 / £29.95 / €39. If you’d like to try Sibelius First for yourself, a 30-day trial version including all features (apart from the 10GB Sibelius 7 First Sounds library, PhotoScore Lite and AudioScore Lite) is available for download now. If you already have a version of Sibelius, Sibelius First or Sibelius Student installed on your computer, don’t worry: the trial of the new Sibelius First won’t interfere with your existing software at all. To find out even more about the new Sibelius First, head on over to the Sibelius web site. Wonderful! It would be great if Sibelius eventually incorporated a recordable microphone track that allowed users to use their score as the backing band for their own vocal or instrumental performance. Looks great! The social sharing tools should be especially useful. The video export feature is very cool – would be nice to have that for the full version of Sibelius as well. Yes, if you upgrade from Sibelius First v6 to Sibelius First v7, it’s just the same as buying a brand new copy of Sibelius First v7, except you pay a much lower price. Hope these new features will be added to Sibelius 7 in the next upgrade. A feaure comparision chart between the Full Sibelius 7 and Sibelius 7 First is needed. Such a comparison can be found here. I just lost my Sibelius First 6 with a computer failure and my disks are in storage for a move. Do I need to get them for the upgrade version that I would install on my new computer? Donna, if you have Sibelius First installed, you can find your serial number in Help > About Sibelius First. Your serial number is all you need for your upgrade. Daniel, is the Keystation Mini 32 keyboard that currently ships with Sibelius 6 First, now going to ship with Sibelius 7 First? If so, that is an awesome purchase! No, the Keystation Mini 32 will continue to ship with Sibelius 6 First for the time being. If you buy a Keystation Mini 32 you can buy an upgrade to Sibelius 7 First for $40/£30, so it’s still excellent value. Later in the year, we expect to refresh the bundled software offerings with our keyboard products, but we don’t plan to bundle Sibelius 7 First with any other products. It’s pretty amazing value on its own at the price we’re asking for it. I purchased the 7 First upgrade download, but after installing program + sounds Sibelius player can’t find the sounds library. I followed the solutions given in FAQ but no result. Is it possible to email me the file locations of the installed product. I am using WinXP as an administrator. Tnx. I am wondering if your software will produce notation from mp3 or is it only via midi? I’ve been using Sibelius 4 enthusiastically for years. Now I’ve changed my PC and I’d install Sibelius First. What about my scores? The maximum extension is four part choir plus organ accompaniment. A quote from the Sibelius First manual: “Deleting tuplets. To delete a tuplet, select the number or bracket and hit Delete. This deletes not only the number and bracket, but also the notes. This is because without the tuplet, the notes would no longer add up.” Because it’s much better to destroy people’s work than allow them to remove the bracket and allow them to correct the note values, is it? No. This is just one of many, many reasons why I regret not trialling Sibelius First for longer so I could decide not to buy it instead of trusting that its popularity would mean that it couldn’t be as frustrating as it is. Can I sell the license to someone else? J’ai écrit ma 1e partition avec Sibelius first ( avant j’écrivais tout à la main ). J’ai utilisé la partition 3 voix + piano. Pourquoi mes barres de mesures pour la partie piano sont-elles disparus alors qu’elles sont là pour les 3 voix ? Comment remettre les barres de mesures pour la partie piano ? Merci de vouloir m’aider. My daughter has a kawai CN 24 piano. Will she be a ble to play a piece of music and print the results as a score? What does Sibelius First v7 include with respect to music notation (engraving) fonts??? … or … must the licensed user pay extra for alternatives to whatever is the default Sibelius First notation font? Is it possible to open Sibelius 7 scores on the new Sibelius First? I have a trial of SF7. When I import a midi file or create a song in SF7 then ask SF7 to determine the chords to play, I often get something like “F#sus4” when I want “F#4”. Some of the chord names are often too long to fit and over print the next chord. How can they be shortened? Is it possible to use Photoscore with Sibelius First. If not, is it possible to upgrade to a full version of Sibelius without having to pay the full amount for the current version.